Calgary Mayor Naheed Nenshi is urging residents affected by flooding evacuation orders to 'gather your valuables and go,' while telling the city as a whole to avoid all non-essential travel on Friday. Calgary Mayor Naheed Nenshi is urging residents affected by flooding evacuation orders to "gather your valuables and go," while telling the city as a whole to avoid all non-essential travel on Friday. "The message tonight is that we are still expecting that the worst has not yet come in terms of the flow," Nenshi told CBC News early Friday in a telephone interview from an emergency operations centre. "The dams will crest on both the Bow and Elbow river over the course of the next little while and the downstream impacts will be significant. "If you live in any of the neighbourhoods that have now been affected by the mandatory evacuation it is time to leave. Gather your valuables and go," said Nenshi, who returned early from an economic development trip in Ontario to deal with the flooding response. The flooding in parts of southern Alberta has a dozen communities under a state of emergency, and in Calgary evacuations could affect up to 100,000 people. Officials in Calgary have warned residents to brace the worst flooding since 2005, with the swollen Bow and Elbow rivers expected to crest by 6 a.m. MT. Calgary officials expanded evacuation orders and opened more emergency shelters Thursday night amid concerns about the rising water levels. The evacuation orders have grown to cover parts of at least 25 neighbourhoods. Some parts of the city have seen water creep over the edge of the river and into yards and streets. Meanwhile, thousands of people in southern Alberta communities like Canmore and High River have also been forced out of their homes by raging water. All Calgary public and Catholic schools have been closed for Friday. Many neighbourhoods are shut even to local traffic. The only movement allowed is people heading out of the area, the city says. Nenshi said Calgarians should avoid all travel. "Tomorrow is a good day to take a rain day ... Everyone's safety is much more important than anything else that might be going on on a Friday." Mike Crawford, who lives in Calgary, said he had to leave his home just after noon Thursday. The evacuation orders cover the communities of Beltline, Bonnybrook, Bowness, Bridgeland Industrial Area, Chinatown, Eau Claire, Cliff Bungalow, Deer Run, Discovery Ridge, Downtown, East Village, Elbow Park, Erlton, Inglewood, Hillhurst, Mission, Montgomery, Quarry Park, Rideau, Riverbend, Riverdale, Roxboro, Stanley Park, Elboya, Sunnyside, Victoria Park, Westmount and Windsor Park. In Bowness, CBC's Kristina Barnes said water levels were high, nearing the top of the bridge. Police were driving along the bridge with a loud-speaker, urging people to stay away. You can find maps of evacuated areas here. Officials ask that people notify their neighbours and mark an X on their front doors after they've left to indicate the house is empty and residents are safe. People are being urged to stay away from river banks as water levels rise. Residents are encouraged to find shelter with family or friends for at least the next 72 hours. 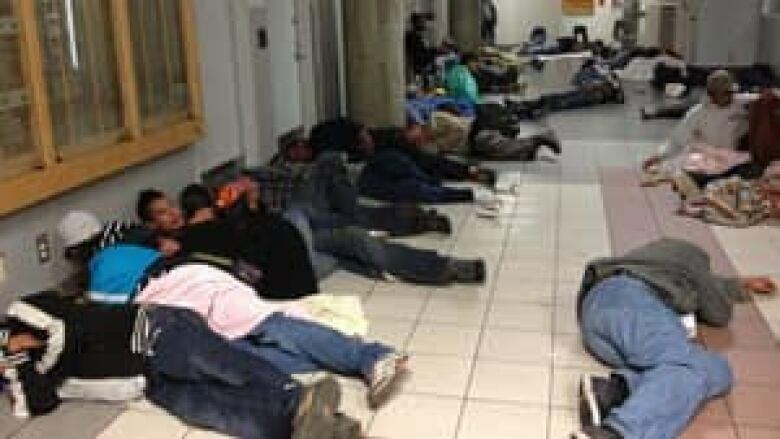 Reception at Southland Leisure Centre and Acadia Recreation Complex centres have been set up for residents who cannot find alternate accommodations. Those reception centres are located at Southland Leisure Centre and Acadia Recreation Complex. People with pets are encouraged to leave them with family or friends. If that option is not available, people can take their pets to the Animal Service Centre. "It's really high right now," Doug McKeague said Thursday as he stood by a raging river in Bragg Creek, one of the areas affected by the rising rivers. "There's a lot of people who are going to be hurting because of it." The city of Red Deer was also on alert. "A local state of emergency was declared at 8 p.m. tonight following a flood warning that was issued upon receiving notice that Alberta Environment is to release a significant amount of water from the Dickson Dam," Red Deer said in a statement. The city held a news conference earlier Thursday after declaring a state of emergency in anticipation of heavy flows from the Elbow and Bow rivers reaching the city. "The data we have currently would indicate that we will probably see water come over the top of the Glenmore Dam, at a flow rate that probably exceeds that of 2005," said Bruce Burrell, director of the Calgary Emergency Management Agency said at the time. The city has also opened its Emergency Operations Centre, where key personnel from city business units and external groups like Enmax, Atco and Alberta Health Services gather to support front-line responders. It is the city's multi-agency command centre for large-scale emergencies. The city has begun to implement its flood response plans and is deploying sandbags and temporary dams at key locations. "We do know that there are going to have to be evacuations, that areas are going to have flooding occur within the city of Calgary," said Burrell. "We know that that is not going to happen until probably late tonight, towards the early morning." City officials are reminding people to stay away from rivers and creeks as the banks may be unstable because of rising water. Residents are also being cautioned to avoid storm water ponds and to keep children away from these areas. Anyone experiencing basement flooding is asked to call 311. Alberta Premier Alison Redford said she plans to visit the areas affected by flooding Friday. "I’ve been following today’s events with great concern, and my heart goes out to the many Albertans who have been evacuated due to the floods that are affecting much of southern and central Alberta today," she said in a release. "I strongly encourage everyone to follow the public safety orders of their municipalities. If you are being ordered to evacuate, please do so for your own safety." Meanwhile, heavy rain also prompted officials in the mountain town of Canmore, about 100 kilometres west of Calgary, to declare a local state of emergency after the banks of a creek that runs through the community became unstable. About 40 homes were evacuated at 2 a.m. MT on Thursday when the banks of Cougar Creek were deemed unstable, Canmore Mayor John Borrowman said. The evacuees were taken in at the town’s civic centre and at two local hotels. Other residents are being alerted to be ready to move if necessary. Borrowman told CBC News Thursday evening that it was the most extreme flooding situation he's seen in 40 years. "We've lost 15, 20 homes," he said. The mayor of the mountain community urged people not to try to come to the area, since flooding was affecting highways. "It's a very serious disaster here," he told CBC News. He said that through most of the day even air access into the community was difficult because visibility was so poor for helicopter flights. Borrowman said he was "expecting another very stressful night of coping with emergencies" as the flooding continued. High River, about 70 kilometres south of Calgary, also declared a state of emergency early Thursday morning after the Highwood River started overflowing its banks. In High River, rescuers used helicopters, boats, and even some combines to get to people who needed to be moved. Cellphone service and landline service in the area was spotty, CBC's Briar Stewart reported, making the situation more difficult in the community of roughly 12,000. "People were really surprised at just how fast the water moved in," Stewart said. "We're told that at one point 150 people were stranded, many of them on their roof, trying to wave in the helicopters in the air to get their attention." All homes and businesses in the hamlet of Bragg Creek, 44 kilometres west of Calgary on the edge of Kananaskis Country, were ordered evacuated as the Elbow River surges over its banks. Power to the area has been shut off. Just downstream, residents of the townsite of Redwood Meadows were told they should leave their homes and use northbound Highway 22 to get out of the area. Townsite administration manager Pat Evans said the water is higher than it was during the last big flood in 1995. In southwest Alberta, parts of the Crowsnest Pass are being evacuated because of high water levels. In Turner Valley, southwest of Calgary, a sour gas wellhead ruptured at the same time as the town dealt with fast-rising flood waters in the Sheep River. Turner Valley Coun. Barry Williamson said the pipeline was struck by river debris, adding that an evacuation was ordered for residences in the area. The rupture caused a release of sour gas containing hydrogen sulfide — a colourless, flammable gas that smells like rotten eggs — but officials have said the risk is now contained. Air quality monitoring at the point of the rupture isn't detecting dangerous sour gas levels.